Microsoft Excel comes with various tools and functions that help you to gather, analyze, and visualize data. This will enable you to generate valuable insights and actionable information. Excel is one of the most powerful tools that can be used on Windows, Android, Mac, and iOS devices. If you want to take excel tutorial online courses, you are at the right place. Browse our tutorials ranging from basics to advanced and you will master excel skills in days. Nowadays, Excel has become an integral part of our day to day life. Whether you are an analyst, sales executive, project manager or technical architect, you need excel to perform a variety of functions ranging from rudimentary calculation to sophisticated dashboards. Excel makes your life easier and lets you store and organize financial data securely. NOTE: To learn more functions and formulas of Excel, you can buy any of the Best Excel Books from the link at a discounted price. 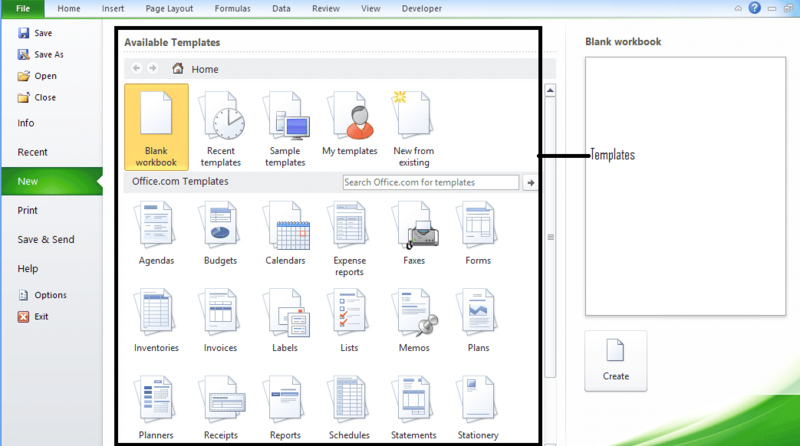 If you open excel, then you will find various templates and spreadsheet options and you can choose one that suits your need or use the default look and feel provided by excel. MS Excel comes with various functions, diverse excel charts, and numerous functions that help you do any kind of analysis, tracking and monitoring in real-time. 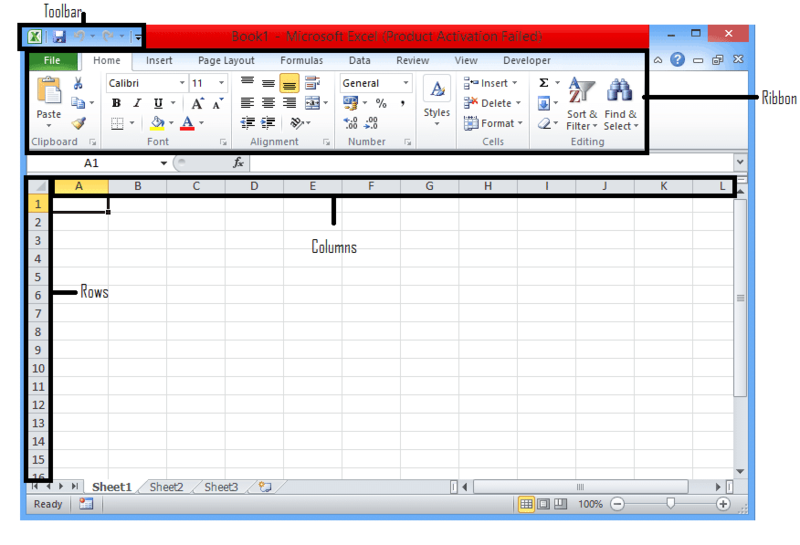 In Excel, you will find that your data is organized in rows and column. All the tools and functions are available in ribbon or toolbar. Go through our detailed pages to understand excel functions, unique address, data validation, excel formulas basic, and other such functions that you can use with one click. Every cell in excel has its own unique address that denotes the cell. You can use this unique address while writing any excel basic formula like sum and average. For example, to calculate the sum of the marks, you can either click on the summation icon placed in the toolbar or start writing the formula using “=SUM(“. Similarly, you can use the formula to calculate the average marks in all the subjects. In this Excel tutorial online, you will find the step-by-step process to learn the functions along with relevant screenshots. 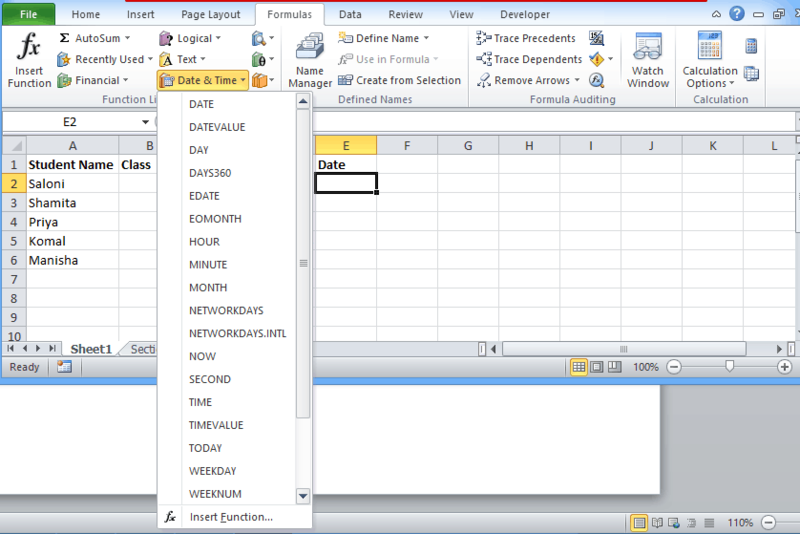 Using the tutorial provided in the site, you will learn how to use various excel functionality efficiently. This will increase your performance at school/work. The Excel tutorial online is a great platform for the beginners who want to refresh basic formulas and functions and those who want to learn cool excel shortcuts to impress. Also, using these tutorials, you can learn to mix various formulas into one at ease. This site covers everything from how to open excel file to applying complex formulas like Excel If Statement Multiple Conditions. To make learning easier for you, we have taken a data set and have applied formulas. Read all the steps carefully and see the corresponding screenshots in posts to easily and quickly grasp the excel fundamentals and advanced functionalities. As part of these tutorials, you can check the step by step process with the screenshots that will help you understand what the cell is, how you can enter data and many other features about excel. You can format cells according to your requirement as well as create the drop-down list in excel by following easy steps. For example, to create the drop-down list you will get familiar with the data validation tool which is there in the toolbar under the ‘Data’ tab. You will find various ways to write excel basics formula such as summation and average by which you can calculate the total sum and average of the numbers. Apart from basic formulas (SUM, Average, COUNT), there are many other operators available in excel for performing the logical test (AND/OR). You will also learn how to calculate standard deviations, format the data and how to insert bullets inside the cell. So, what are you waiting for? Jump straight away into reading and practicing the tutorial listed below. Microsoft Excel offers various functions and supports various features. You can create Excel Charts which you can use in creating power point presentation. With the help of this chart, you can make your senior management understand the track record and total sales earned by the company. In fact, you can show them 5 years of data also. Not only this, you will find an excel pivot chart that you can create via a pivot table. One of the most important features provided by excel is a pivot table, the feature that allows you to extract the data and field from the large size detailed data set. Let say, you have a data set that consists 1000 fields and you want to extract the details of those people who live in the United Kingdom then you can apply Excel Pivot Table on the data set and gather fields easily. The vlookup function in excel is a vertical lookup that is designed to find the value organized into the columns. The function will find the value in one column of the data set and return the value in another column. Apart from the extracting data, you can highlight duplicate data using conditional formatting excel formula. You can apply this conditional formatting on cells depending on the various criteria. In fact, you can change the format of the cells, its font, and font size as well as cell borders and shading using excel cell formatting. There are other such functions excel macros and VBA array in excel that saves time and effort wasted in doing the particular task and repetitive tasks. To get the detailed idea of all these advanced functions you can click on the links listed below and get the learning process started. Using Microsoft Office on Android device is quite easy and portable. The Microsoft Excel is available absolutely free. To download Microsoft Excel for Android, go to the play store and look for it and click on download icon. Ms Excel is compatible with Mac devices also and works on operating system Mac OS X 10.10 and above. Not only Excel, but you can also download other Microsoft Office apps like Word, Outlook, and Power-point. You can use excel similar as you were using it in Windows with only change is that Excel for Mac does not support pivot charts. Microsoft Excel is compatible with iPads that has the operating system of iOS 7 or above. You can efficiently use it to store and access Ms Excel. On the iPad, you can start working on the Excel via iPad. Place the pointer of the mouse on the border of columns A & B at the header side of the column. When you place the pointer, it will change into the double-headed arrow. Now click your mouse button twice and it will widen the column size accordingly. Go to the formula tab located at the ribbon. Look for the Date & Time function and click on it which will open the list. Click on the Today function and then again OK.
You will find current date added into cell C2. In every company, if you go for an interview then they will be going to ask you about excel as it is very important nowadays. If you are also preparing for an interview to get selected for your dream company then you can start practicing Excel Interview Questions and Answers. Read all the questions and answers carefully and start practicing. These are the questions which most of the interviewer ask at the time of the interview.